The last couple of weeks have been pretty eventful for me, with a lightning trip to our Calcutta campus to sort out some business for a couple of days, immediately followed by a short break in Pondicherry, an enclave of Tamil Nadu on the East coast. Pondy is a lovely place, a former French colony and still carrying many traces of those times, from the street signs in French and Tamil, to the menus in the restaurants including Steak-Frites and even French being spoken in places. I spent a lot of time wandering the streets looking at the architecture, some of which looks like it could have been teleported in from Paris, along with older stuff which is a strange fusion and difficult to place, both in space and time. I have a bunch of pictures on flickr. Although I enjoyed being there, it was really hot — around 35 degrees every day. I had naively assumed that being by the sea would make it cooler, but the sea breeze during the day was actually hot! And it only got down to about 20 degrees at night. My tendency when on holiday is to explore on foot, to get a idea of how the place works, and to take pictures… given the heat this wasn’t such a great strategy, and although I enjoyed exploring a lot, and even bumped into my first elephant here, I was soaked in sweat almost immediately after venturing out of the hotel each day, and ended up with blistered toes. 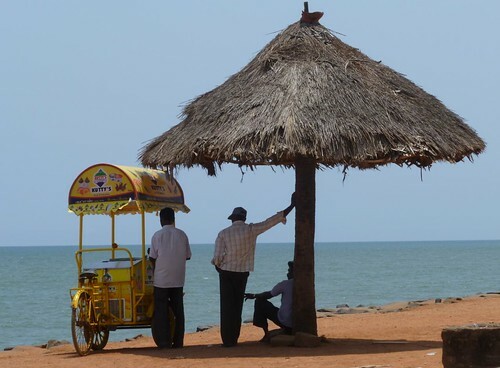 The sea-front in the town is almost totally undeveloped, with a single café right in the middle, and a few hand-carts selling snacks. So there didn’t really seem to be many options for places to chill out, and hardly even any shade. But by the final day I’d finally found a proper pace, having a leisurely lunch in the courtyard of the Hotel de L’Orient and reading a book. Next time I’ll try to adopt these tactics a bit earlier I think. Then straight after getting back home there was the big India vs Pakistan semi-final in the Cricket world cup, shortly followed by the final against Sri Lanka on the Saturday. India won both of course, much to the joy of my Indian colleagues here, and the population in general. Cricket really is big news here, and although I’m not really interested in sport I did follow the final as best I could on-line. As with the semi-final, Saturday night ended in partying in the street and lots of fire-crackers. It was nice to share everyone’s joy a little, even if I don’t actually understand the rules of the game! And now, after a public holiday yesterday for Ugadi — effectively New Year in this part of India — it’s the start of term already. At the college where I’m teaching there are 4 terms per year, with a week off inbetween. Gone are the long holidays I was used to in the past. (Although to be honest it was rare to actually go away for very long because there was usually so much work to do during the so-called vacations.) I’m already thinking about what I might do during the week at the end of June. The monsoon will have arrived by then, so I’m expecting life to be a bit different.